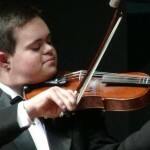 16-year-old Emmanuel Bishop is a prodigy violinist and polyglot—who speaks English, Spanish, French and Latin—with Down syndrome. Despite his genetic condition, which occurs when an individual has a full or partial extra copy of chromosome 21, he is an ambitious young man who lets nothing stand in the way of his dreams. Emmanuel, an only child, is currently home-schooled. At the age of two, he learned to sight-read on violin. His parents always believed in their son’s abilities and stood by him, helping him overcome any difficulty. At the age of six, he read a welcoming address in three languages in front of 600 people at an Annual Conference on Down syndrome in Saint Louis. In addition to his musicianship and multilingualism, Emmanuel is also an avid athlete. He has already set six junior Down Syndrome Swimming World records. When he was eight-years-old, the teenager won Special Olympic medals in both golf, which he declares to be his favorite sport, and aquatics. At ten, he went won the 200 and 400 freestyle swimming competition. Emmanuel is also a devout Christian, who firmly believes that he must use his gifts from God for a greater cause. He tries to demonstrate that people with Down syndrome are like everyone else and have their own talents to show the world. He became an altar server at the age of thirteen and was confirmed at fourteen. He has community prayers on many occasions. In many parts of the world, children with Down syndrome are not allowed the chance to live; many women chose to abort their pregnancies upon prenatal test results. In the United States alone, 60 to 90 percent of babies with Down syndrome are aborted, according to a 2012 analysis of 24 studies in Prenatal Diagnosis. In the United Kingdom, 90 percent of women end their pregnancies if their baby has Down syndrome. One of the reasons for the high rate of abortion is that many women lack adequate information on what it means to raise a child with Down syndrome. While people with Down syndrome experience cognitive delays, the effects are mild to moderate and obscure each individual’s talents and strengths. At the same time, people with DS have an increased risk of getting congenital heart defects and respiratory and hearing problems. Many of these health issues are now treatable. Emmanuel is an advocate for children with Down syndrome and aims to raise awareness about their skills and potential by presenting his own story as an example of what kids like him are able to achieve when given the chance. He has spoken at numerous Down syndrome conferences and retreats, describing his diverse and incredible experiences, accomplishments, passions and ambitions. In his presentations, he aims to counteract the low expectations of children with Down syndrome, show that his challenges do not preclude the joy of living and mitigate the prevalence of false information about people with Down syndrome coming from those who do not have it. Emmanuel is a remarkable teenager and a wonderful example of talent, ambition and disciple for everyone. Click here for the story of another extraordinary youth with Down syndrome living his dreams.